Got this great RAK card from Kathy the other day and I love it because not only is it one of the American Art Stamp chicks (this one actually looks like a girl!) but it uses the cuttlebug and as a girl that owns no "bug machines", I love to see what people are making with this nifty gadgets. How cool is it that she inked over the embossing?!! And she wrote the nicest little note too, love that personal stuff. 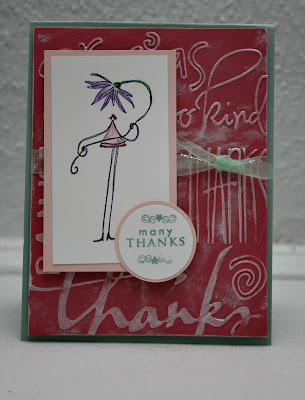 Kathy's got a great blog, Kathat Stamps, which has great projects and weekly eye candy. I also love a glimpse into the Cali way because as a midwest gal, it seems like a million lightyears away and wonderful. Thanks Kath- Love being bloggie buddies too!! Don't forget to check out all my freebies and sale stuff, they are going fast...Thank goodness! I too, own no 'bugs (well, except my many bug stamps) but I love the look of embossed BGs!